There are tax implications for practically every type of transaction. One area of the tax code that can get particularly complicated is the transactional tax issues from buying real estate or businesses in the United States while you are living abroad. For U.S. expatriates and foreign nationals, the tax implications of these transactions need to be handled carefully to avoid causing any unwanted tax problems. The U.S. real estate market is an attractive financial option for foreign investors seeking to stabilize, strengthen, or diversify their portfolios. Income and withholding tax requirements imposed by the IRS for these transactions are complex. Failure to follow the complicated declaration procedures could result in additional penalties plus interest. If you have rental income from U.S. properties or U.S. real property investments as a foreign taxpayer, you need a skilled CPA working to manage your affairs. Certified public accountant Ted Kleinman has over 30 years of experience handling business tax issues for expats and foreign nationals. US Tax Help can help simplify even the most convoluted and ambiguous sections of the tax code to minimize your tax liability. For a consultation, contact US Tax Help at (541) 923-0903, or contact us online. We are available 24/7 because we acknowledge that some tax issues simply cannot wait. A U.S. person can incur US taxes on their worldwide income and some worldwide assets. Foreign nationals and expats are subject to income tax on U.S. sources of income. A foreign national or non-resident alien is not a U.S. person and can be a foreign individual, foreign corporation, foreign estate, and even a foreign trust. There are various taxes that you should be aware of if you own real estate or a business in the United States. Ownership or control of real estate in the U.S. Currently, there is a $60,000 USD estate tax exemption for foreign nationals that own property in the United States at the time of their death. 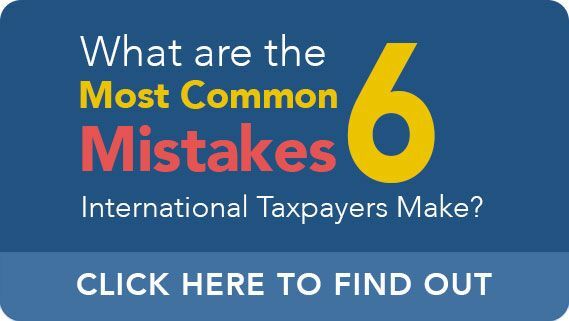 Depending on the country you reside in there may be a tax treaty that can limit your estate tax if you are a foreign national. There may also be state tax laws that you must adhere to depending on where in the U.S. your property is situated. It is also important to note that the estate tax exemption for a U.S. resident is $5.6 million for individuals in 2018 and $11,200,000 for married U.S. citizens. With the broad changes to tax laws due to the Tax Cuts and Jobs Act, there are many incoming changes to U.S. tax law. At this point, it may be worth it to consider U.S. residency if you have not already. If you are a non-resident alien and you have property in the United States for the sole purpose of using it as a personal residence your income tax consequences are likely minimal. However, if you own property in the U.S. and use it to generate income, you are subject to income taxation. Rent is one of the most common U.S. sources of income that a non-resident alien (NRA) will deal with if they own property in the United States. An NRA can also be taxed on dividend income from a corporation that is incorporated within the United States. Depending on your circumstances, there may be an exception to dividend income taxation. As mentioned above, if you have an interest in the debt of a U.S. resident, it will be considered U.S. source income. US Tax Help can help you sort through which of your U.S. situated properties are subject to taxation and determine whether there is a way to minimize the effects of that taxation. Nonresident aliens are taxed the same as U.S. resident aliens and citizens when it comes to activities or assets that are used in a U.S trade or business. This means that income is taxed at a graduated rate that will increase or decrease depending on the income derived from the business. The tax code does not exactly define what a trade or business is instead the IRS looks at the type of activities and economic interests that the business has within the United States. Income made from the operation of a business in the U.S. If a foreign national does not operate a U.S. trade or business but continues to reap profits from a business, the profits they earn may be taxable. It is also important to note that the federal government does not restrict the ownership of real estate by foreign nationals. However, some states may impose some restrictions on the right to own property. For example, some states may deny the right of a foreign national to inherit real estate. While some tax treaties can invalidate some of these rules, you should ensure you have sufficient knowledge of a state’s laws before you purchase property in that state. Trust in my Experience: We not accept any work that we are not 100 percent confident that we can deliver positive results for, leaving you completely satisfied. Membership in Prestigious Accounting Organizations: We have the endorsement of multiple peer organizations, including the Oregon Society of Certified Public Accountants and the American Institute of Certified Public Accountants. Specializing in International Taxes: We have a keen focus into international financial planning and tax law. Ted Kleinman has worked closely with hundreds of clients to solve their real estate investment matters by leveraging every available deduction and tax credit to minimize exposure. Preparation of federal and state income tax returns, withholding returns, exemption applications, and other reports (U.S. Department of Commerce, etc.). Identification of available deductions such as inspection trips, management fees, depreciation, amortization, etc. Determination of timing of income and deductions (now, later or never). Recommendations regarding payroll and employee fringe benefits. Private citizens and even foreign governments continue to buy up real property in the United States. Norway alone has more than $870 billion in U.S. land in its sovereign-wealth fund, including buildings in high-value cities like San Francisco and New York. The trend may only increase as the housing market recovers and property values begin to rise again. The most popular cities for foreign investors to buy land in the United States in 2014 include: New York City, San Francisco, Houston, and Washington, DC. Adding U.S. property to your own investment portfolio is a sound financial maneuver, but doing so requires careful tax preparation. If the IRS decides that your interest in domestic real property constitutes being “engaged in a U.S. trade or business,” the entire game changes for your filing requirements and exposure to tax liability. What may have only been a flat tax paid through withholding could turn into a full-scale investigation demanding much larger payouts to the federal government. Even if you only plan on earning passive rental income, you need to consult with an international tax CPA to ensure you are protected. You can reach US Tax Help by phone, email, or through the contact form — day or night. US Tax Help remains dedicated to resolving your foreign investor tax matter in the fastest amount of time possible. US Tax Help is prepared to provide transactional tax assistance to foreign persons in the Cayman Islands, Bermuda, Austria, Belgium, Japan, Mexico, Russia, and several other places across the globe. Tax accountant Ted Kleinman is determined to provide you with tax assistance that is geared toward your unique tax issues. To schedule a consultation, contact (541) 923-0903, or contact US Tax Help online today.